While the movies of Frank Capra once celebrated the triumph of good over evil, George Bailey has given way to Hannibal Lecter, who through raw power and bold creativity lives "beyond good and evil." 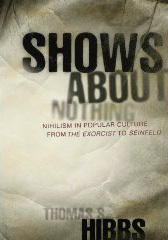 Professor Hibbs follows the trajectory of evil in American film and television, linking it to the spread of nihilism-a state of spiritual impoverishment and shrunken aspirations to which, both Tocqueville and Nietzsche warned, democracies are especially susceptible. The most recent product of Hollywood's fascination with evil is the comic nihilism of Seinfeld, in which the distinctively American pursuit of happiness is endlessly frustrated by dark forces beyond our understanding or control. Professor Hibbs probes the themes and artistry of the landmark works of the cinematic quest for evil. A series of grisly films from The Exorcist to Cape Fear and Silence of the Lambs reveals a preoccupation with the power of evil. When evil ceases to terrify, it becomes banal, producing a comic view of the meaninglessness of life (Forrest Gump, Natural Born Killers, Titanic, The Simpsons). Seinfeld and Trainspotting represent nihilism's last stage, but not the last word, and Professor Hibbs considers how classical ideals - partially recovered in recent comedy (Pulp Fiction) and film noir (L.A. Confidential, Seven) - might point the way out of nihilism.